I've divided the kit up into ten gear categories. But before I itemise these, please bear in mind that every trip is different. Are you going for two days or two months? Are you taking photos as a primary activity or just so you'll have some holiday snaps? How serious are you about quality? Are you traveling to harsh environments or just the next town over? Do you prefer macros? Close-ups? Interiors? Portraits? Shots of wild animals in their natural habitat? How much do you mind carrying? Will anyone else in your party be sharing your gear? That's a lot of questions, but it certainly helps the planning stage if you take a moment to think about each. In my case I can say I am dedicated to image quality, look for serious photo opportunities no matter where I am, generally travel for only short periods, don't go to harsh environments (but would love a trip to the desert some day) and need a camera for my wife as well as myself. I generally shoot macros, nature and urban with some portraits. My wife and I like to capture the small details of places we visit, whether that is a store sign, a menu or a typical museum exhibit. The first thing is to choose camera bodies. Do you shoot film or digital or both? Is it worth packing that heavy medium format kit? Will you be satisfied with a point'n'shoot? In my case the answer to that last question is "no" and I own only APS-C sensor digital SLRs. So the choice is easy. For short trips, or those where I am the only photographer, I would take the Pentax K20D. It's not shown in the kit photo since it is taking the picture! For longer trips where my wife also wants to take shots, I would include the Pentax K100D Super, as illustrated. It's smaller and lighter than the K20D and has the advantage of using AA cell batteries, which are available literally everywhere. Having two bodies means we can both have a camera on hand, plus we have the benefit of two lenses ready to use. I don't mind switching lenses out in the field, but doing so too often can get in the way of enjoying an outing. And a holiday should first and foremost be about enjoyment! Be sure not to forget any chargers you need. At home I have a professional slow charger, but it's too big and cumbersome for trips. Pictured is a typical fast charger. If traveling to a different region, make sure your chargers can deal with universal voltages! You will also need prong adapters for your destinations, though I have not shown these here. If you take film cameras be sure to take a decent supply of film with you; you cannot count on getting what you want on site, unless you know your destination well. Digital photographers will need lots of memory cards. I shoot RAW, which means the files are large. With the 6 megapixel sensor K100DS I get 110 RAW files per GB of storage. Of course this varies with the image, but that is a real-world average. I use two 2GB and one 4GB SD cards for a total of 8GB. This amounts to 880 images. Is this enough? Well, that depends on how you shoot. It also depends on whether you plan on emptying the cards during your trip. For a longer holiday, I assume you will. So your maximum capacity is limited only by how often you wish to backup. Of course you can always shoot JPG instead. I was able to get 500 images per GB, meaning that my cards allowed 4000 images without needing to off-load any. That is a goodly amount! With the K20D things are different, thanks to the 14 megapixel sensor. I get 75 RAW images per GB but, oddly, only 105 JPG images. This must be something to do with how the image compression has been calibrated. I have two 8GB cards for exclusive use with this body. That's 1200 RAW images. Between the two cameras we've got a capacity of over 2000 images. Since I take the time to delete obviously bad ones in-camera (usually while sipping a coffee or pint), this is quite sufficient for even a week or more. 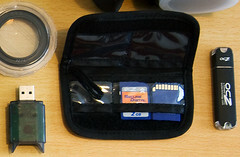 One last thing shown in the photo: take a little storage pouch for your memory cards. When you have filled a card, place it back upside down. It'll then be obvious which ones are ready to use. If you want to be extra careful, flip the write-protect tab on cards that are full. Included in the photo above is a USB stick. This represents backing up your images. This is essential for any but the shortest trips. Even if you don't fill your memory cards you should back up the precious photos you have taken! There are several methods. The most expensive is to buy one of those dedicated USB host drives. Simply plug in your SD cards and the images are sucked off. But these are too dear a proposition for me. Instead, simply buy a portable USB hard drive. Make sure it runs off the power from a single USB connection -- not all do. Spend some time in an internet cafe and backup your images. Be sure to make two copies if you plan on erasing your memory cards. One copy is never enough! For the second copy either burn a DVD or upload the images to a web host somewhere. Depending on the available bandwidth, one or the other might be more time intensive. A website has the advantage that your precious photos are stored at a different location -- handy if your gear or luggage gets lost or stolen. But you can get around this problem using the DVD method with the following simple expedient: instead of carrying them with you, mail the DVDs to yourself back home. This is all the support I need. 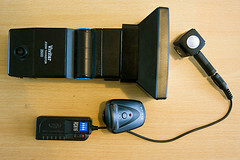 The K20D can be too heavy for this mini-tripod, but the K100DS is fine. Use it on tables in pubs, on the ground in urban situations, or any time you need extra stability and can find a flat surface. 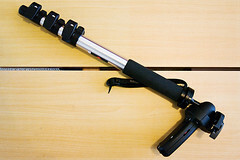 You might prefer one of those grippy tripods you can wind around poles and the like. Planning a safari or need to shoot out of car or train windows? Here's a tip I read somewhere: bring an empty beanbag, one you can zip up. When you get to your destination fill it with lentils, dried beans or rice. Wind down the window and rest your camera on the beanbag. Empty it again before returning home. Make a nice soup with the fillings! I don't believe in taking "proper" monopods or tripods with me on holidays. First of all, many airlines will no longer let you carry them on board; they're a deadly weapon don't you know! So you have to check them and I never want to check any of my gear. Secondly, they add considerably to your weight allowance in these times of serious restrictions. More important, hauling them around on a day out can kill the joy of the occasion. The monopod pictured above came with me on one eight hour hike, but never again! It is also the case that tripods are not permitted in many places, unless you get a permit. This includes museums, galleries, malls, railway stations and other busy concourses. Plus anywhere in Manhattan! Check the rules before you travel. Of course, if you know you are going to need serious stability for the sort of shots you have to get, that is a different matter. Get used to being a pack mule. I find that a cheap remote control like this is all I need. It's easier, smaller and more versatile than a cabled shutter release. This cost me about two bucks on the net. I can use it when I set up the mini tripod thingy. 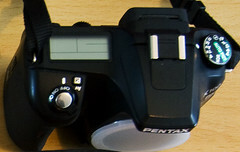 Only the "S" button does anything on a Pentax camera, but you can set up your body to autofocus when it's used, if you like. It can also be handy for getting candid shots. If your hand is nowhere near the shutter button, people don't expect you to take a picture. Tricksy! It's important to keep your camera clean. For lenses I favour the lens pen: it's got a brush on one end and an eraser nub gizmo on the other. Compact and lightweight, this is a no brainer for inclusion on any trip. For sensor cleaning I love the Arctic Butterfly. No fluids, no muss. But the truth is that the built-in sensor cleaning on the Pentax cameras works very well. If you do not plan on changing lenses much, and don't anticipate very dusty or windy environments, you might just be able to leave this one at home. 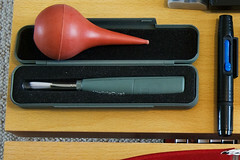 Also pictured is an air blower, which some people prefer. I don't think I've ever used a lens cloth; I prefer the pen. And then you need a bag to put it all in, which is another article. Consider that you may take a good amount of gear on your trip, but you may not need it all with you each day. So you may require a smaller bag for your daily outings, but a larger one for transport to and from your destination. Also think of how much other non-photographic equipment you may wish to have with you on a day out: your wallet, passport, purse, rain coat, etc. Sometimes a non-photo bag can be fine as a photographic day bag. I travel with a couple sheets of the thinner bubble wrap. With this I can shroud precious gear or create cozy little pockets for my camera. Finally, here's a picture of something else I don't pack for holidays. It's an older manual flash with filter hood and remote trigger. I use it mostly at home for macros. But I would not bother taking it with me, as it adds too much weight and bother. Remember that if you take a flash you'll need to ration extra batteries! Me, I stick with natural light shots. If I was totally into portraits that might be different. I hope this article has helped you put together your own holiday checklist. Check it once and check it twice. Then find a nice secure way to pack it all up in your carry-on luggage. Don't take more than you absolutely need. Attentive readers will have noticed I skipped discussing that little circular thingy in the top photo. In the next article I'll discuss lenses, the tenth and last gear category, along with lens filters. As always further suggestions and discussion are welcome! I await your comments. P.S. Sorry for the rather average quality of the illustrations. P.P.S. 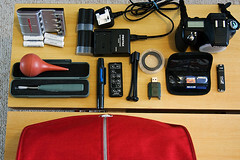 This article was partially inspired by Scott Coulter's Flickr page What's Missing From My Bag?. As a reader elsewhere has pointed out: I keep the plastic contact protectors with the K20D batteries. These caps add nothing to the weight and protect against shorts. Likewise for items like AA batteries I use tiny padded plastic bags that I've saved from various packaging I've received over the years. This helps keep them together and prevents them scratching around in the bag.